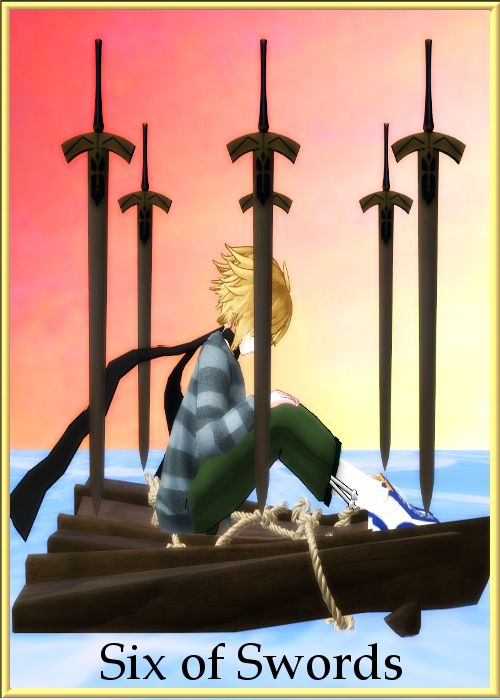 The Six of Swords is the sixth card in the Swords Suit of the Minor Arcana and presents the fifth challenge of the suit. This card reminds me that “life finds a way” and that there is “light at the end of the tunnel” since no journey or trial lasts forever. Sometimes it feels like there is no end in sight. It’s at times like these I need to remind myself that the only way out is through. The challenge here is to get ourselves to slog forward to the end, even if it feels like wading through mud uphill. Now as a writer with everything we’ve gone over with this card what comes to mind? Start writing! Doesn’t matter what it is. Stretch your mind and let The Six of Swords speak to you.